RISBY Park is one of the best known fisheries in the Humberside area and is fast gaining a strong following among the area’s club, open and pleasure anglers. There are now four ponds on the site, which first opened for fishing approximately 25 years ago. The carp pond (Gillen Springs) is heavily stocked with mirror, common and ghost carp from 4oz to 22lb, tench from a few ounces to 3lb, bream to 7lb and there are also small roach and varying size ‘ide’and perch. The depth of water ranges from 5 t around the island to 7ft 6in at peg 38. The tench pond (The Gorse) is again heavily stocked with predominantly tench to 10lb, ide to 3lb, skimmers to 1lb and there are also large stocks of chub and roach which provide great pole and waggler sport,plus carp to double figures. 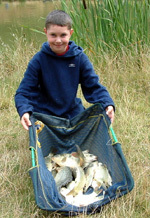 This pond is particularly suitable for the younger angler as there are plenty of bites to keep the interest flowing. However, it’s also a great match water and weights up to 80lb are taken in summer in five hour events and the match record is 72-3-0 from peg 25. Match weights, which have increased annually, have been recorded at around 60lb for both ponds. Depth on the tench pond varies from 2ft 6in at the narrow end, 4ft 6in at the aerator and a maximum of 6ft 6in at the widest end. A typical Folly Lake catch. Folly Lake, which opened in 2002, is a three-acre match and pleasure lake. This renovated historic lake, nestled within Risby Wood, is bounded by an ancient folly and boasts ample, convenient and safe parking and a generous peg spacing of 12 metres. The lake was extensively stocked with thousands of fish, predominantly carp ranging from a few ounces to 10lb, plus ide from 2oz to 3lb, tench to 5lb, skimmers and bream to 3lb and some roach and perch. Pleasure nets have exceeded 100lb of fish and the current match record is 192lb-0-0 for a five-hour match during 2007. The newest pond to open is the Orchard Pond, which is adjacent to the carp pond. Nestled between two wooded areas, the pond has its own car park and has been pegged at 10-metre intervals to accommodate 20 anglers, making it good for small clubs. It has been stocked with thousands of small carp to 6lb with bags of up to 60lb already recorded. Once again this is a firm favourite for the novice angler. The water is popular with clubs. In winter it pays to fish the inside line with sweet corn or meat for big fish or fish in the middle on the bottom with maggot whilst feeding small balls of groundbait. In summer matches are won by fishing 18 inches deep with maggot and caster whilst spraying maggot. These methods work well on all ponds. One point that they like to stress at Risby Park is that anglers must take good care of the fish, so please handle you catch carefully. Use of a landing net is a must and while pleasure anglers can use keepnets, they should be emptied with care and at regular intervals, especially in hot weather. Carp over 3 lb should be returned straight away. Thanks partly to the inclusion of pond aerators in each pond, the water quality at Risby is excellent. For anglers and clubs coming from some distance, the owners are more than happy to pass on phone numbers of local bed and breakfasts where you can stay from £15-£20 a night and there is also nearby caravan/camping site. The venue has a large cafe which can cater for up to 45 people serving breakfasts and hot and cold snacks. Risby is an excellent and fast improving venue that makes an ideal water for a club booking or pleasure session. Day Tickets: £6 (£4 concessions for The Gorse, Gillen Springs and Orchard Pond. After 5pm you can buy an evening ticket for £4. Tickets for Folly Lake cost £6 (£4 concessions), with an evening ticket £4. Extra rods £1 each (£2 each on Folly Lake). Winter Day Ticket prices are £5, and concessions £3. Contact: Anthony on 07860 255981 or 01482 862049. Matches: Club booking welcome and dates are available this season. Restrictions: Barbless hooks only; no rods to be left unattended at any time; fish may be retained in keepnets for a maximum of five hours. There are no baits bans but anglers are asked not to throw in excess bait after matches. Radios and bikes are banned, and children under 12 must be accompanied by an adult. Fishing from dawn till dusk only. Strictly no litter. Facilities: Generous, safe car parking. Open all year.